Music is large part of our world, it is everywhere. We hear it at the store, in the car, in commercials, people share their favorites on social media. Growing up I never really thought about the lyrics, but I can hear a song on the radio from 25 years ago and I can sing every word. The words in songs must have some impact on our lives even if we don't think they do. That is why I like music that has uplifting encouraging words. 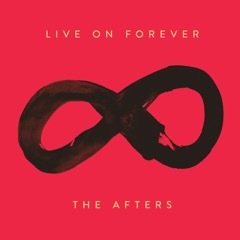 The new CD Live On Forever from The Afters music is upbeat and the lyrics are definitely encouraging and uplifting. When I was offered The Afters new CD Live On Forever my first thought was do I know any of their songs. My teenage daughter gave me that look......You know the teenager look!! She picked up her phone and played me some songs that I love that are by The Afters. This new album is pop music that is very uplifting and encouraging. When The Afters started to record their new album they had several close friends experience tragedies. Including the band's soundman, Anthony Martinez, infant daughter's death. "If any theme has emerged, it would be 'inspiration and motivation,'" Josh Havens (lead singer), says. "Look at the titles we've selected: They reflect themes of 'rise up, get up, God has your back, you're not in this alone.' We thought, 'Let's encourage people and let this be a weapon for people's faith: something they can hold onto.'" The Afters will be touring with the Newsboys this fall to more than 45 cities. I have an additional copy of The Afters new CD Live On Forever to giveaway to one of my lucky readers in the United States or Canada. I will pick a winner on September 22, 2016. Use of Endorsements and Testimonials in Advertising”): Many thanks to Propeller Consulting, LLC for providing this prize for the giveaway. Choice of winners and opinions are 100% my own and NOT influenced by monetary compensation. I did receive a sample of the product in exchange for this review and post. Only one entrant per mailing address, per giveaway. If you have won a prize from our sponsor Propeller / FlyBy Promotions in the last 30 days, you are not eligible to win. Or if you have won the same prize on another blog, you are not eligible to win it again. Winner is subject to eligibility verification." Love Light Up the Sky, but Broken Hallelujah chokes me up. Every time. can't say I am familiar with them at all. no i haven't heard them before. but i am going to go to youtube to check them out right now. I've listened to The Afters, and if I'm remembering correctly I've seen them at a music festival too. I'm not familiar enough to have a favorite song, but I'm very interested in this CD because I just love what I've heard so far and its theme. This is a new group for me. So I haven't listed to them before today. I have not listened to this music before. I haven't listened to their music but seeing this post has me searching on youtube! I've listened to Live On Forever on YouTube, and we really liked it! I have never heard of The Afters before. I love to discover new groups though. kristiedonelson(at)gmail(dot)com Thank you. I have listened to the title track on youtube and really liked it. This is a new group for me. They're new to me, but I just listened to Live On Forever and really liked it! I have listened to the Afters. I like the song Battles. I have never heard of them but would love to hear em! I have not listed to the Afters before. I have never heard them but am always up for a new band.